Restaurants, hotels and other businesses in the catering and leisure industry have some of the highest footfall of all. With high staff numbers necessary and huge numbers of patrons coming in and out on a daily basis, keeping clean is essential. Most businesses in the sector will invest heavily in cleaning in the most obvious of places – floors, surfaces and everything that can be seen, but fewer consider the benefits and importance of ceiling cleaning. Your business’ ceiling could be harboring more than just dirt and grime, and what’s more, an unclean ceiling doesn’t give a great first impression. More importantly, ceilings in kitchens and nearby areas may harbor germs and could pose a danger to your patrons. At Penn Jersey we offer restaurant and hotel ceiling cleaning in a way which ensures minimal disruption to your business. As an exclusive Ceiling Pro practitioner, we use their unique process to quickly and efficiently clean your acoustical ceilings, removing dirt, grime, odors and more. See the quality of our work on our Before and After Shots Page, you may not even have realized how dirty your ceiling was. There is no doubt that there is huge competition in the hospitality sector. Every hotel and restaurant owner knows how important it is to impress patrons and attract them back as repeat customers. Key to your business’ success is creating a fantastic first impression. Great staff and fantastic services are part of this but the environment which you offer to your patrons is also key. If your lobby is unclean or seems dark and dingy due to dirtied ceiling tiles, why would anyone come back for another meal or stay? Unclean ceilings make environments seem dark and unwelcoming. They can hold onto unpleasant odors and can in many instances harbor germs and bacteria. If you are serving food in your premises, patrons are not going to enjoy their experience if they sense any idea of the uncleanliness or lack of hygiene. High quality ceiling cleaning is one of our key services. We are a proud Ceiling Pro practitioner offering highly effective and efficient cleaning for many different types of ceiling. We work with many hospitality businesses bringing their ceiling back to their best and ensuring brighter, cleaner and much more enjoyable environments for all visitors. Our commercial ceiling services ensure your restaurant or hotel has a ceiling which is food safe, hygienic and as close to good as new as can be achieved. Utilizing the unique specialized cleaning processes Ceiling Pro offers, our cleaning services transform your ceilings and ensure they are something you can be proud of. Our restaurant and hotel ceiling cleaning services also offer exceptional value and we are ready and waiting to get started and help your business. Our process returns your ceiling to like-new condition and the process is quick and effective, ensuring you shouldn’t have to lose any business hours or close the premises. Kitchens are among the busiest and most hectic workplaces around. Grease, oil and other food residue spread easily and while a good kitchen team ensures clean and hygienic floors and surfaces, the ceiling isn’t always as easy to deal with. 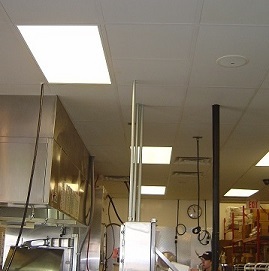 We can provide professional ceiling cleaning for your commercial kitchen, ensuring sanitization, disinfection, and deodorization as well as complete cleanliness. Food preparation areas have to be safe and clean so you are able to serve food which is acceptable for your patrons. The risk of contamination, spread of germs and bacteria is considerably higher if any part of your kitchen is not kept as clean as possible. While the ceiling may not be a food preparation area it can still harbor germs and potential contaminants. Some may be airborne and others may be able to contaminate food in other ways. Every element of your professional kitchen should be as clean as possible and while you can keep on top of every day cleaning duties, professional ceiling cleaning for kitchens and restaurants is recommended every few months. Our professional ceiling cleaning teams work at times to suit your business, so as not to disrupt service or meal times, and quickly and efficiently ensure the complete cleanliness of your ceilings. Traditional cleaning methods work but can be time intensive. Alternatively, you may have considered replacing or painting your ceiling to deal with any cleanliness issues. Our commercial ceiling cleaning ensures better value than all these options. Our specially trained service crews will be in and out as quickly as possible, at your convenience. We appreciate that your business may operate 24/7 and ensure our work is quick and stress-free, so your business activity is uninterrupted. Our cleaning processes are designed to keep your ceiling in the best possible condition for as long as possible. Painting over dirt and grime is never recommended, especially in food preparation areas and full replacement may not be necessary at all with a full professional clean. We can work reactively if there is a quick and urgent need for a clean. We can also work contractually or as and when you need to use our services to return your restaurant or hotel ceiling to its absolute best. Get in touch today to discuss your business’ ceiling cleaning needs.